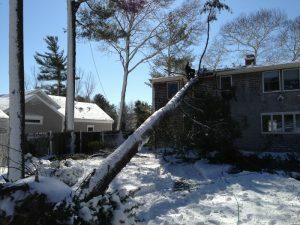 Winter tree removal Ottawa - Crowe Tree Service Inc. In this cold season, the only tree removal you may be thinking about maybe cutting down your next blue spruce or Douglas fir. But most likely there is a diseased or dead tree in your compound. Winter season may be the perfect time to remove it. This is all in order to avoid it coming down on your house or damaging your property letting you suffer the harsh cold weather and winter snow storms. During winter, almost everyone sticks to indoor activities and you will not find people hiking, camping or walking around the wooded area around your house. This makes it the best time to clear those large trees. Also, the safety of your family is ensured as your kids are not running around the yard where tree removal may be ongoing. Thick foliage makes it difficult to see what branches of the tree are dead and decaying or are diseased in need of cutting. However, during the winter season arborists have a clear vision of the trunk at the very top of the tree. After tree removal, the lack of leaves makes it even an easier job cleaning up. The winter weather hardens the ground making it the optimum conditions to bring in the big guns. The large trucks and machinery used in tree removal are favoured by the cold season and suffer a minimal risk of getting stuck unless the ground is covered with snow. After the tree trunk is cut you will have to wait for the ground to soften in order to remove the stump. But this is a non-issue considering you have done away with the risk of a tree damaging your property during a storm. Evaluation of the tree is simpler – As winter season gets closer, trees start becoming dormant and start dropping their leaves. When winter is finally upon us the trees are completely dormant and have no leaves. This makes it easy for the arborists to assess the tree structure and it is easier to spot dangerous or dead branches hanging on the trunk. Spring appearance – Trees pruned over the winter period are able to recover more quickly before spring. Especially if they are done late in the winter you will have minimal time looking at a pruned tree. Less chance of diseases spreading – Most of the insects, bacteria, fungi and parasites that spread and create disease are usually dead or dormant meaning the chances of developing problems with your tree, later on, is greatly reduced. It is not unusual to have people believe that tree maintenance cannot be done during winter or that tree maintenance businesses do not operate during the cold and snowy months. Winter tree removal and pruning is key to have your tree looking amazing during spring and also reduces the chance of suffering damage to your property during a snowstorm.